My intention with this post was to pass along a couple more summer salad recipes I have recently tried and enjoyed. Then it struck me that they both contain quite a bit of cilantro. I will still pass the recipes along, of course, but I also took a minute to look up the health benefits of cilantro. Now this is an herb that could easily be confused with flat leaf parsley at the grocery store, but really packs a punch in the flavor category and smells great (at least I think so). Cilantro is a relative of the carrot and it's seeds are known to us as coriander. This first recipe was a hit at a recent neighborhood party. Combine the dressing ingredients in a blender, using 2 teaspoons salt, and pepper to taste; process until smooth. 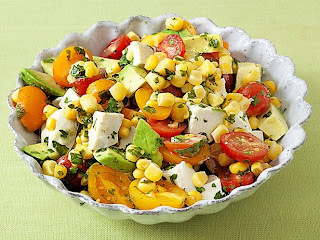 Combine the salad ingredients in a large bowl and toss with the dressing. Let sit at least 15 minutes before serving, or cover and refrigerate for up to 4 hours. My whole family enjoyed this next salad. If you are not a fan of beef, try ground turkey or no meat at all. I would still be good! Heat a fry pan on medium-high heat until hot. Pour the canola oil in and coat the bottom of the pan. Add the meat, breaking it up and letting it brown. When the meat starts to sizzle, add the packet of taco seasoning mix and 1 cup of water. Cook according to package directions. When done, drain the fat and set the meat aside to cool to room temperature. To make the vinaigrette dressing: Place all the ingredients in a glass bowl and whisk, cover and set aside. Can be made 3 days ahead and kept for a week in the refrigerator. Chop the lettuce, arugula and baby romaine into small chunks and add to a large salad bowl. Add the scallions, corn, carrot, cilantro, black beans and cheese. Sprinkle 1/2 teaspoon of kosher salt and vinaigrette dressing, mixing well. Add the avocado and toss gently. Serve with your favorite salsa, extra lime wedges, a dollop of guacamole and some crushed tortilla chips! Mmmm! Sounds good...I can't wait to try both of them!